This site hosts data sets published by Transport Infrastructure Ireland. All data sets here are lincensed under the Creative Commons Attribution 4.0 International (CC BY 4.0) licence unless otherwise indicated. Details about how TII shares data with the Public can be found here . The search facility for this site is provided by National Open Data Portal and includes datasets not hosted here. Click the Search Datasets button below for a listing of all datasets published by TII. Only datasets hosted here are listed below. Under Directive 2010/40/EU directors of roads are required to provde real-time and other travel information on major routes. This information is shared using relevent and open standards. The data sets on this page all comply with the DATEX II standard for real-time travel information exchange. The datasets listed below are updated at 5 minute intervals. Showcase web and mobile applications built using DATEXII data can be found on the TII Traffic website. Current estimated travel times between travel time sites. Sites referenced by the travel time estimates. Meteorlogical data collected by TII's network of roadside weather stations. Locations of TII's roadside weather stations. TII is committed to the twin objectives of providing safe and efficient national roads. Improved roads and the elimination of traffic collision locations contribute to a more efficient transport system. Education, Enforcement and Engineering are recognised in the Government Road Safety Strategy (2013-2020) as three essential factors for reducing road collisions and fatalities. TII’s endeavour to provide a safer network of national roads is mainly focused on Engineering. Network Safety Ranking is the process of using collision data to rank the safety of the national road network and to identify high collision locations (HD15 sites). The data is in Shapefile and KMZ/KML format, PDF renderings of the data are also provided. Collision data used for this process is collected by the Road Safety Authority, click here for the latest data map for Ireland . The average collision rates on the various road types (motorway, rural and urban dual carriageway, and rural and urban two-lane) are available here. For each record (about 5,500 in total and each represents about 1km of the network) the sinuosity is calculated. It is a ratio of the actual length over the shortest path defined by the start and end nodes of the 1 km section. Smith et al. (2006, 22nd ARRB conference proceedings) found drivers experience concentration difficulties on lower demand roads rather than high demand roads. Sinuosity is also considered as part of a safety barrier risk assessment. Dublin's Light Rail Transit system is called the Luas. It has carried over 285 million passengers since launching in 2004. 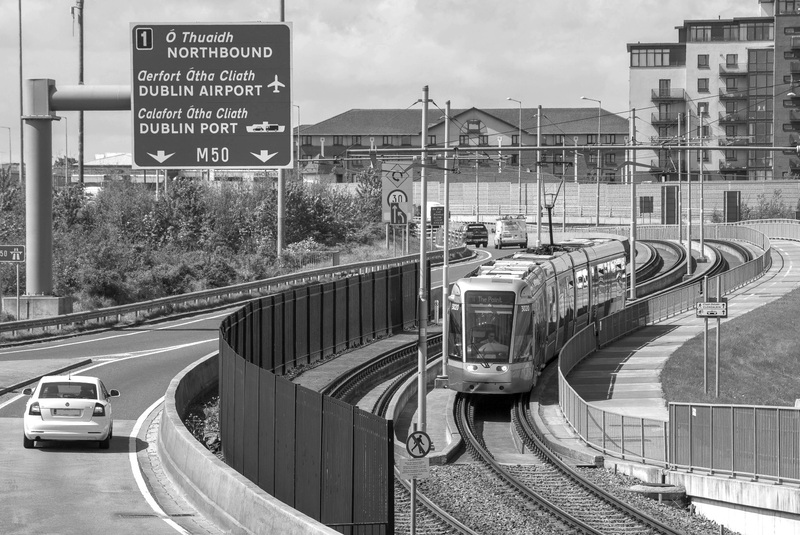 The Luas network consists of two separate lines, the Red Line and the Green Line, which have been extended in recent times. The locations of all Luas stops are available in GeoJSON, Tab, Shapefile and KML formats. A near real-time API for estimated time of arrival of trams at each of the stops along the Red and Green Lines. And API to a calculate fares from one stop to another. See here for a sample API query. Consideration of archaeology is fully integrated into TII's transport planning process for national roads, light rail and metro. Data is available as a (zipped) Shape File and as KML which will allow the data to be viewed with Google Earth and other tools. The dataset contains records of site excavations carried out by the National Roads Authority (NRA), now operating as Transport Infrastructure Ireland, in preparation of various national road construction scheme over the last decade plus. Data is available as a (zipped) Shape File and as KML which will allow the data to be viewed with Google Earth and other tools. The dataset contains information on various sculptures and road-side art on routes along the National Road Network. TII operates, maintains and improves the national primary and secondary road network in Ireland. Find out how we provide travel information, traffic data and emergency services as well as manage and control our network and its traffic. Data is available as a (zipped) Shape File and as KML which will allow the data to be view with Google Earth and other tools. Dataset contains line geometries for the National Roads Network as at the end of 2013. Data is available as a (zipped) Shape File and as KML which will allow the data to be view with Google Earth and other tools. Dataset contains the locations of marker plates used for the location referencing system on the National Network. TII commissions an Annual Sideway-force Coefficient Routine Investivation Machine (SCRIM) Survey of the National Primary and Secondary road network in one direction, alternating the direction of survey each year. The data reported is the Characteristic Scrim Co-efficient (CSC) from the Slow-Lane.The information provided is summarised in 100 meter intervals and is referenced to GPS ITM co-ordinates.SCRIM Survey data is currently available from years 2012. Detailed technical infomration about SCRIM data and its application is available on TII Standards and Technical Publications website. Please Note: Currently the traffic count data, as disctict from the Counter locations, are only available via the TII Traffic Counter Website , however work is underway to make this data available as a raw dataset which will be made available here in due course. Data is available as a (zipped) Shape File, GeoJson, Tab Separated Values, GML and as KML which will allow the data to be viewed with Google Earth and other tools. The dataset contains point geometries indicating the location of counters as at 2016. Data is available in the same formats as Traffic Counter Locations. The dataset contains point geometries indicating the location of the 6 weigh-in-motion sensors. WIM Sensors are designed to collect data related to vehicle weight and distribution. TII use this data primarily for research purposes. A large data set of approximately 330Gb is size and 6.5 billion data points recording vehicle movements on the National Road Network. Due to the size and nature of this dataset, data consumers will likely require some specialised tools and knowledge to handle and process it. The Traffic Counter sites are provided here as a separate data set. This is a static data set covering the period Nov 2012 to June 2016. Data is available as a (zipped) text file containing tab separated values. The dataset contains per vehicle records capturing the weight, number of axels and axel loads recorded by weigh-in-motion sensors in 2014. The data is presented it 2 sets. Wim-2014-all.zip contains records for all vehicles while the smaller file Wim-2014-gvw-over-3500.zip, contains records only for vehicles with a recorded gross weight of more than 3,500 kg. This is a machine readable data set of all current toll plaza names, descriptions, locations and tolls. It is provided in JSON format. The locations are provided as GPS coordinates, formated as latitude and longitude. Tolls are expressed in euro amounts. The detailsUrl field provides a link back to more detailed tolling information on the TII website. The baseDetailsUrl is the address of the site and should be combined with the detailsUrl. Datasets hosted on data.tii.ie are provided under a Creative Commons Attribution 4.0 International (CC BY 4.0) licence. This is consistent with the Public Service Policy and the terms and conditions of the National Open Data Portal . Before downloading or consuming any of the datasets listed on this site you are strongly encouraged to read the summary of the Licence to understand your obligations in consuming it. The full licence is also available here (Its not as long as you'd think). More Information on the licensing of Open Data from Public Bodies can be found here. Read our Privacy Statement to find out how we protect your information. Terms & Conditions can be found here.